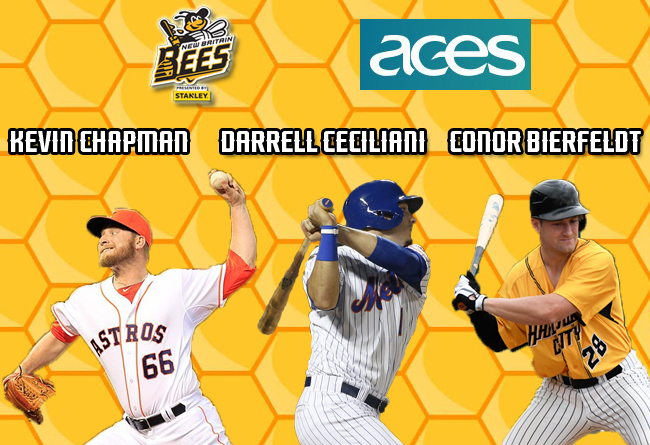 (New Britain, Conn., April 3, 2018) – The New Britain Bees today announced the signings of pitcher Kevin Chapman, and outfielders Darrell Ceciliani and Conor Bierfeldt. Kevin Chapman comes to New Britain for his Atlantic League debut during his ninth year of professional baseball. Last season, the former big leaguer split time between Triple-A Gwinett (Braves) and Triple-A Rochester (Twins), appearing in 18 combined games, and collecting 25 strikeouts in 22.2 innings pitched. The 30-year-old was originally selected by the Kansas City Royals in the fourth round of the 2010 MLB amateur draft. He spent two years with the Royals organization before being traded to the Houston Astros. After a couple successful campaigns with the Astros, the lefthander made his Major League debut with Houston in 2013. He would spend parts of four seasons with the big league club, appearing in 58 games and posting a 3-1 record with a 4.09 ERA, 48 strikeouts, and one save over the course of 55.0 innings of work. In 309 career minor league games, Kevin has collected 17 wins with a 3.99 ERA, 455 strikeouts, and 32 saves in 369.2 innings pitched. Darrell Ceciliani joins the Bees for his Atlantic League debut and 10th season of professional baseball. The former big leaguer spent last year with the Toronto Blue Jays organization, including three games with the Major League club, collecting two hits and three RBI. He also appeared in a combined 28 games with Triple-A Buffalo and Single-A Dunedin. The 27-year-old began his professional career with the New York Mets after being selected in the fourth round of the 2009 amateur draft. Prior to last season, he spent his entire professional career in the Mets organization, reaching the Major Leagues in both 2015 and 2016. The slugger appeared in a combined 55 games during his big league career, collecting two home runs, seven RBI, nine runs scored, and five stolen bases. Over the course of 641 career minor league games, Darrell has comprised a .284 batting average with 41 home runs, 126 doubles, 275 RBI, 384 runs scored, and 137 stolen bases. Conor Bierfeldt returns to New Britain for his second season in the Atlantic League and sixth of professional baseball. Last year with the Bees, the CT-native slugged a career best and team leading 23 home runs, while posting a .238 batting average with 15 doubles, 61 runs scored, and 64 RBI. The 26-year-old was drafted by the Baltimore Orioles in the 29th round of the 2013 MLB amateur draft out of Western Connecticut State University. He spent four years in the Orioles organization, reaching as high at the Double-A level with the Bowie Baysox in 2016. In 505 career minor league games, Bierfeldt owns a .233 batting average with 79 home runs, 111 doubles, 309 RBI, and 239 runs scored.